Burkina Faso President Roch Marc Christian Kabore Friday pledged to further the development of ties with China. Kabore made the remarks while meeting with Chinese State Councilor and Foreign Minister Wang Yi, who is on an official visit to the country. Reiterating that there is only one China in the world, the president noted that his country is committed to strengthening its relations with Beijing based on the one-China principle. Kabore appreciated China's support for the country's economic development and the improvement of the people's livelihood, saying that the people of Burkina Faso are filled with hope of the future of bilateral ties. Noting the regional security is a major concern of the country, Kabore said Burkina Faso thanked China for its support for Sahel countries' efforts to safeguard regional peace and security, and hoped for more of such support from China. Burkina Faso and China share the same stances on many international issues including upholding the role of the United Nations, and his country is ready to enhance communications with China to safeguard the interests of African countries and developing countries, said Kabore. The Chinese state councilor said that Kabore's major decision of resuming diplomatic relations with China has won unanimous support from the people of Burkina Faso, and has been widely welcomed in the African continent. 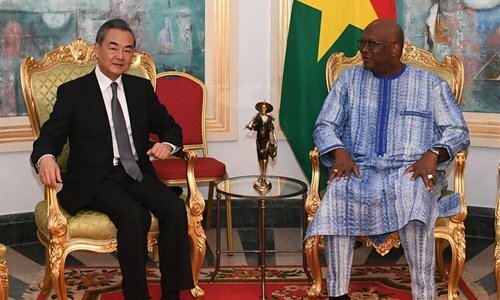 History will prove that the resumption of diplomatic ties between the two countries has been a right decision, which fully conforms to the fundamental and long-term interests of Burkina Faso and its people, said Wang. Both sides should firmly support each other on issues concerning their respective core interests, said Wang, adding that China believes that Burkina Faso will continue to follow the one-China principle. Wang said that the resumption of diplomatic relations between the two countries has laid a political foundation for bilateral cooperation, adding that China will do its best to help Burkina Faso in various fields such as economy, people's livelihood, health and education. He also said that China is willing to work with Burkina Faso to deepen peace and security cooperation.